According to a Truckee Airport official report (here and here), with over 25,600 operations (take off and landings) per year and growing, the number of flights and plane noise complaints in the area is showing a sharp increase in 2015 over the same period of 2014, as well as over the 12 months ending in June 2015 when compared to a preceding 12 month period (7/1/13-6/30/14 and 7/1/14-6/30/15). The Truckee Airport reported a 100% increase in large private jet (over 50,000 lbs) flights within a one year period, from zero in 2013-2014 to 87 in 2014-2015. Flights by private jets between 20,000 and 49,999 lbs increased by 13% as did flights by jets between 12,499 and 19,999 lbs by the same percentage. There was a 16% decrease in flights by small jets within that period, but turboprop operations increased by 37%, twin piston operations by 13% and single piston operations by 37%. 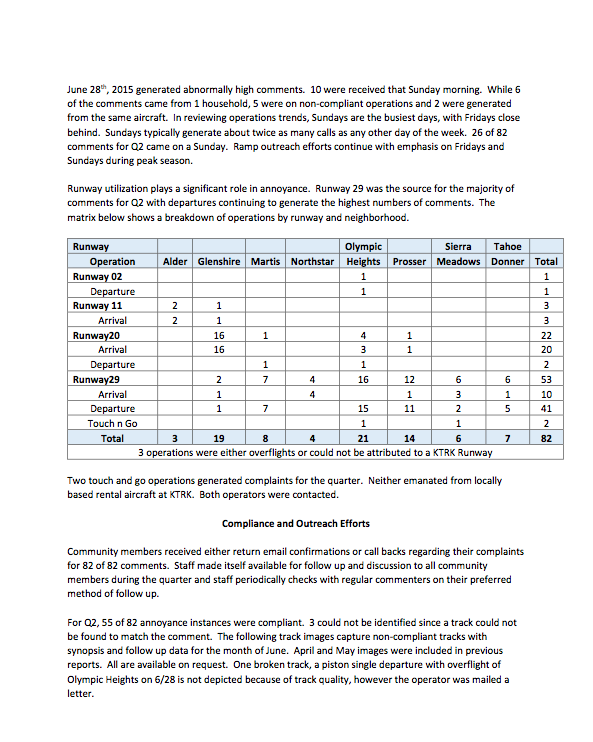 Truckee Airport plane noise complaints from residents of Martis Valley Estates increased by 650% from 2 to 15. 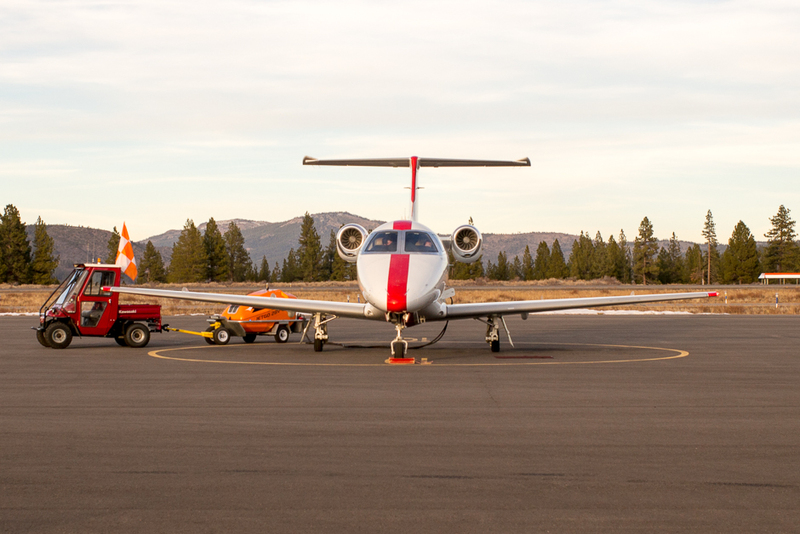 Truckee Airport plane noise complaints from Tahoe Donner increased by 338% from 8 to 35. 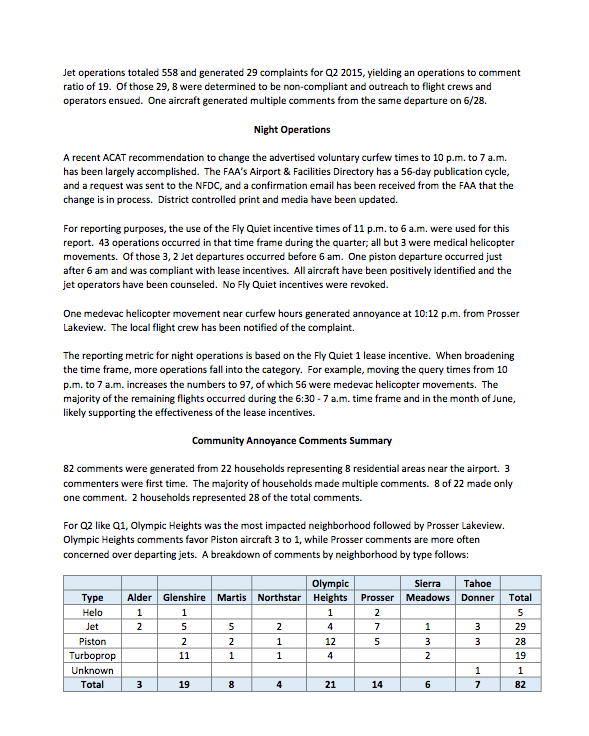 Truckee Airport plane noise complaints from residents of Olympic Heights rose by 319% from 27 to 113. Truckee Airport plane noise complaints from residents of Glenshire rose by 275% from 16 to 60. Truckee Airport plane noise complaints from Ponderosa residents rose by 364% from 11 to 40. Truckee Airport plane noise complaints from Prosser residents rose by 138% from 21 to 50. Northstar residents dropped the number of their complaints from 37 to 9. Complaints from unknown locations grew by 40% from 10 to 14. 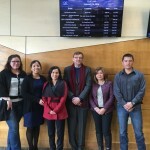 The current Truckee Tahoe Airport District Board of Directors and staff seem unable or unwilling to take drastic legal measures to reduce plane noise, and particularly jet noise disturbance to local residents who pay $4.5 million from their property taxes as an annual subsidy to the airport. Between January 1, 2011 and September 30, 2014, jets represented 16.1% of operations at the Truckee Airport. After Truckee Airport Board Director Mary Hetherington pointed this out at one of recent board meetings and noted that this triggers the Truckee Tahoe Airport Board of Directors Resolution on Limiting Jet Noise (at 15% of operations), current Board President John Jones said that the resolution ought to be “scrapped or modified” because it is “outdated.” He also said that the 2004 resolution is “open to interpretation.” Ms. Hetherington also brought up the issue of some community members being concerned about “bullying” at Airport Board meetings. 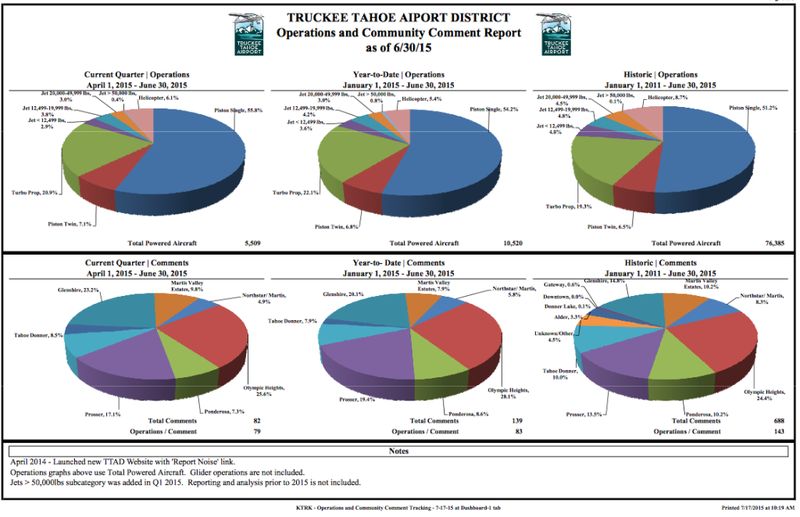 The latest Truckee Airport operations report for the slightly longer period from January 1, 2011 to March 31, 2015 show jet operations at 14.4%. The Airport staff assured Board members that the 2004 Resolution has been more than fully implemented, suggesting to members and the community that everything is just fine. 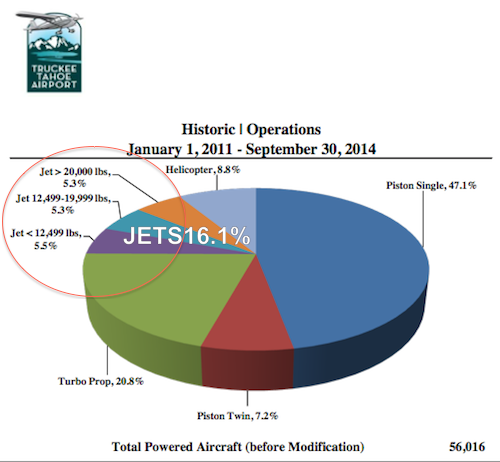 “There is no debate that Jet operations in 2014 are at or above 15%. Of 22,764 operations, 3,448 were jets, or 15.1%. And to be fair, jets are generally quieter today than in 2004. But regardless of the intended triggering values or even aircraft type, subsequent Airport Boards, Staff, and ACAT members have worked over the years on mitigation tactics well beyond the scope of the Resolution. The local property tax subsidy supports staff salaries as well as modern, well-maintained facilities which can be used for air travel by only a very small number of the most affluent members of the community and visitors who can afford private plane travel. The public property tax annual subsidy of $4.5 million had also been used in the past to purchase open space around the airport and to maintain a golf course in the general area where a plane had crashed. But airport officials have been aggressively advocating recently for directing some the of public money they get every year from local taxpayers to aviation-unrelated causes which they privately support (they recuse themselves from voting on such proposals). This means that there is less money for open space purchases, for airport and aviation safety, and for encouraging alternative travel to Truckee that is less harmful to residents’ quality of life and the environment. Every flight not taken to this dangerous airport contributes to safety, especially in bad weather and in hot summers. In the summer, density altitudes often exceed 9,000′. 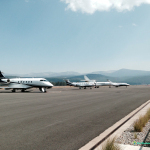 The Truckee Airport Board Directors and staff have also been considering building a new $9 million jet hangar which a few local NGOs may be able to use on rare occasions for private or public functions, including banquets for large numbers of people. 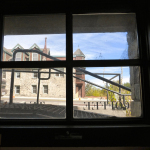 Less expensive options have also been considered, but all of them involve spending public money. A few years ago, a private plane crashed into one of the existing hangars at the airport but did not explode. The pilot was killed. A promotional brochure for the new jet hangar produced by the Truckee Airport showed a group of young children using an airport hangar. Airport officials reported that just in the second quarter of 2015, 55 of 82 “annoyance instances were compliant.” This means that while airport officials believe these planes are flying according to aviation rules, they still generate an increasing number of complaints from the community because the number of such flights, which may be compliant with noise abating rules but still unacceptably noisy and disrupting to many residents, has been growing. 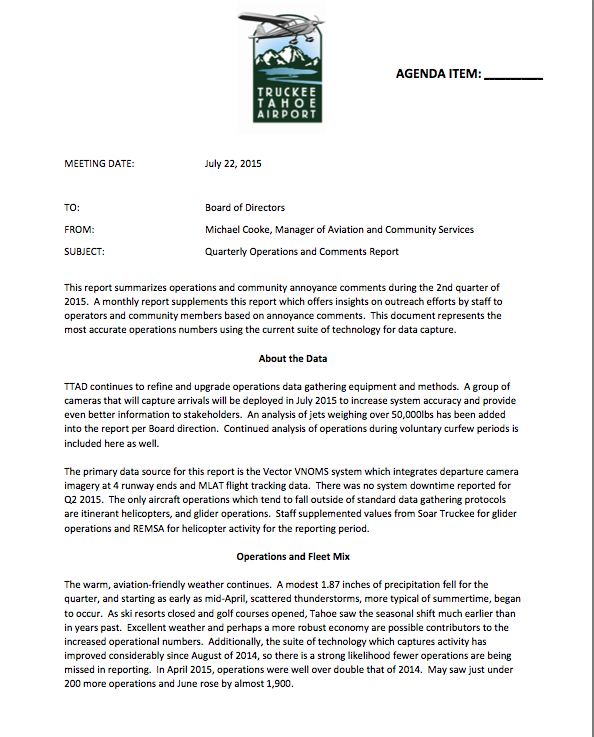 The following quotes are from the Truckee Tahoe Airport “Quarterly Operations and Comments Report” for January – June 2015. 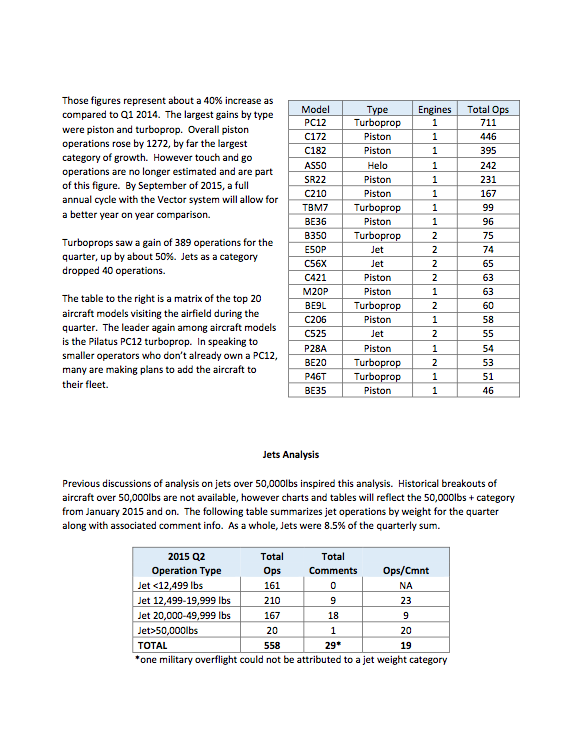 Supplementary charts to the Truckee Airport plane operations and noise complaints report can be seen HERE. Some of them are reposted below. 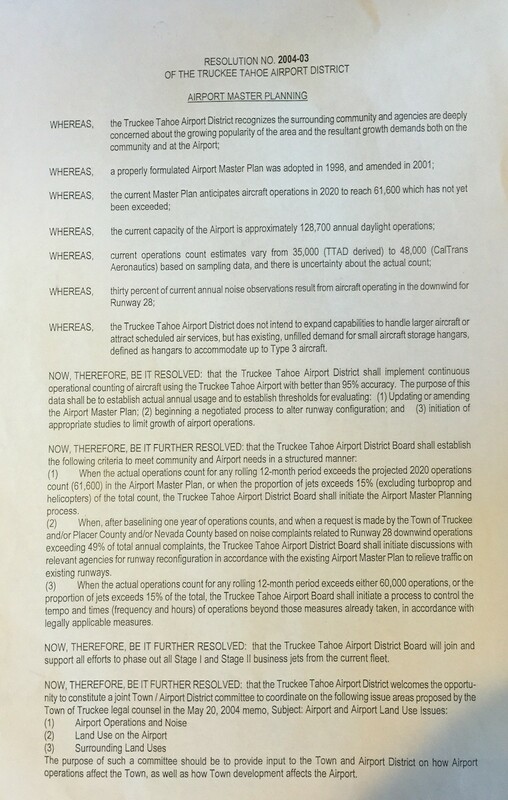 Supporters of the growth of Truckee Airport’s jet flights, turboprop flights and pleasure flights have advanced several arguments in support of their views that such flights (and their predicted future growth) do not damage the quality of life of local residents and the environment, and if they do, the impact on residents and the environment is minimal and offset by economic benefits. Supporters of the $4.5 million annual local tax subsidy to the Truckee Airport like to point out that cars and trucks on I-80, as well as the trains passing through town and fire engines, also create noise and pollution. The Truckee Airport is not used for air travel by the vast majority of local residents, yet it still receives a large special annual local property tax subsidy that I-80 and train companies do not receive. (The Reno Airport does not receive any subsidy from Reno residents.) Some public services are absolutely necessary for emergency purposes, and local taxes support them. Flying a private jet to Truckee instead of Reno is done purely for small personal convenience if it is not an emergency. Neighbors, as seen from the Truckee Airport reports, do not like it. We all support emergency flights. Another argument of supporters of growth of jet and other flights to and from Truckee and supporters of the tax subsidy is that affluent users of the airport pay large property taxes, patronize local business and hire domestic help. 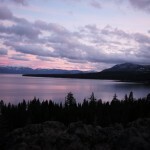 However, affluent individuals who do not fly planes and do not disturb their neighbors with jet noise and pollution in the small and quite fragile Truckee-Donner valley and in the Lake Tahoe area also pay the same large taxes, patronize the same local businesses and hire domestic help. If owners of vacation mansions who fly private jets here were to be replaced with more environmentally concerned permanent residents who do not, the benefit to the economy and the environment could be much greater. Affluent permanent residents spend money locally 300 to 365 days a year, while second home owners spend very little. Permanent residents are also less likely not to be concerned how their potential travel plans using loud private jets might eventually affect them and their neighbors. It is unlikely that no one would buy expensive houses in the area if they could not get here in loud jets flying over their own homes and their neighbors’ houses. Affluent individuals who are unconcerned about the environment and their neighbors and who spend very little time here may also be much less generous toward local charities, businesses and employees. We need more affluent permanent residents who are concerned about the environment, their neighbors and the future of this town. We also believe that many current private jet passengers may not realize how negatively their travel habits affect their neighbors and the community. They should read the Truckee Airport plane noise and residents’ complaints reports and consider modifying their travel plans. Still another argument is that Truckee residents who bought houses here knew about the existence of the airport and bought their houses at a discount if these houses were affected by plane noise. This may be true to some degree, although many home purchasers do not pay sufficient attention to the disclosure documents. It is also true that plane traffic and particularly jet traffic was not as common when many permanent Truckee residents bought their houses. These Truckee residents are now paying part of the $4.5 million annual subsidy to the airport and have every right to decide how their tax money is being spend. They can demand that Truckee Airport officials take various effective legal measures to discourage further growth in jet and other plane traffic, particularly optional private jet travel and weekend hobby flying which disturbs many neighborhoods. 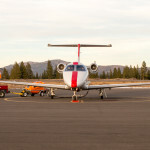 It is also true that Truckee Airport officials have not informed the community in an effective way about the current growth in private jet traffic and industry predictions of continuing growth of private jet traffic unless effective measures are taken to discourage such growth by presenting and encouraging alternative travel arrangements. Another argument is that the Truckee Airport contributes money to socially worthy causes, such as buying open space. This, however, is done with public money, not private money from the Airport or private money from its users who are the ones who largely benefit from the local property tax subsidy. Open space and the golf course are paid for by taxes of local residents, not by plane owners and passengers or the Truckee Airport’s money. 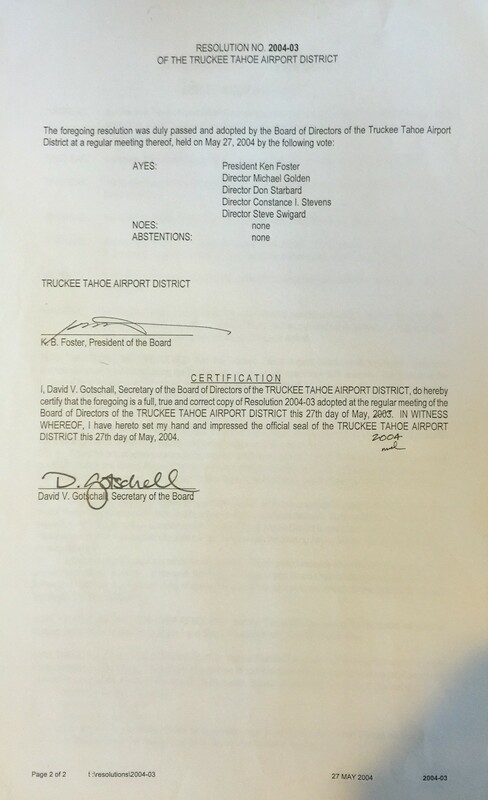 The money that Truckee Airport uses is public money from local property taxes. The airport’s users do not cover its full expenses. While plane operators also pay landing fees, they are not enough to maintain the airport in the style to which they have become accustomed. Public money, therefore, should continue to be used for buying open space and for supporting emergency flights, but local residents have every right to ask that it not be used to support further growth of jet traffic and building new facilities for private jet owners. Such growth inevitably causes more jet noise, damage to the environment and further lowering of home values for some Truckee neighborhoods. 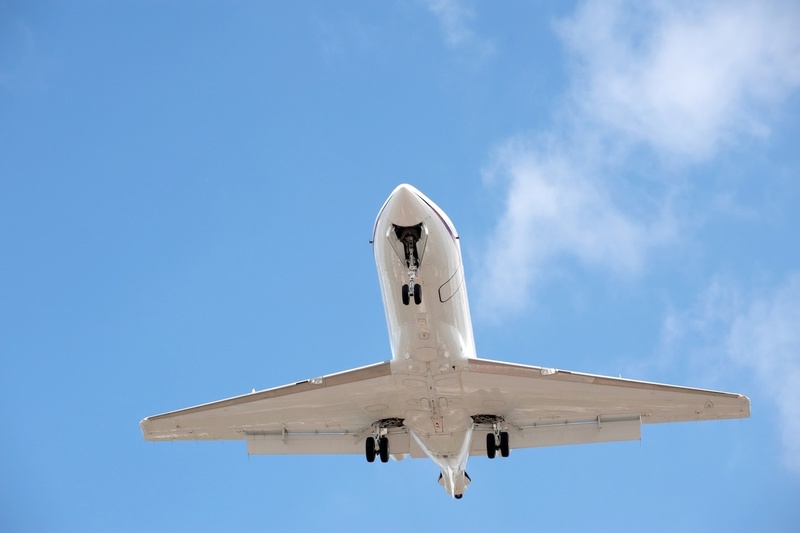 Critics have claimed that it cannot be proven that increasing plane traffic and jet noise does any serious damage to the environment, disturbs individual residents and wild life and causes home values in some neighborhoods to drop. We have provided links to various studies showing that it does. Some critics argue that the current level of plane traffic is no big deal and that there may be only one jet per hour. Plane traffic in Truckee is not evenly distributed over a 24 hour period or throughout the year. Some neighborhoods have experienced six loud low-flying jets in just one hour on some weekends and holidays. Critics will also point out that FAA determines how planes fly over the area and that there are noise abatement procedures in place which most pilots follow. It appears, however, by the evidence of growing traffic and the growing number of residents’ plane noise complaints that Truckee and its valley are simply too small for a great number of planes coming here, and something needs to be done about it. Critics also say that it is their right to fly, that individuals who are complaining and are concerned about their own quality of life and the environment are infringing upon their right to fly. They also point out that planes had been flying to Truckee long before local residents bought houses here and started to complain. That may be true, but some 50 years ago no one could have predicted the current grow of private plane travel, especially private jet travel to the area and the area’s overdevelopment. Some habits that become unsustainable for environmental and health reasons have to change. Smoking cigarettes in public is no longer acceptable and neither is leaded gasoline. These were considered quite normal several decades ago. The right to plane travel is also not unlimited when it starts to encroach on neighbors and the environment in a significant way and when it may damage the character of Truckee as a resort mountain town. Once Truckee’s appeal is ruined due to overdevelopment, its attraction as a destination and its economic base will also be ruined. Discretion, restraint and concern for one’s neighbors and the environment are absolutely necessary for this very fragile area to survive and prosper in the long run. We were, of course, also called by a few individuals who appear to be pilots: “tree huggers,” “liberals,” “communists” “haters of millionaires and successful people” and “haters of planes.” These names were used against us for suggesting that out of consideration for their neighbors and their own children and future generations, owners of private jets and hobby weekend flyers should consider more eco-friendly modes of travel. We suggested such actions as taking commercial flights or even flying their private jets to Reno. We also hinted that engaging in other sports instead of pleasure flying might be well received by their neighbors. One or two individuals told us to pack up and move somewhere else. As to the “liberal” or “socialist” label, we pointed out that, on the contrary, accepting a tax subsidy from the many that benefits primarily only a few individuals while Truckee cannot even afford a decent public library could be described as “socialism” for millionaires or “corporate welfare.” One individual used even more insulting language, which we will not repeat here. 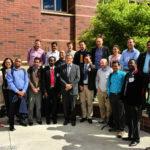 Some of our major supporters–we are an all volunteer organization and we contribute our own money–happen to be fiscally responsible and successful conservatives who like planes and often use commercial air travel, flying to Reno. We were told by one individual that there are plenty of places in Truckee for students to study with free access to the Internet and that a new public library is not needed. We strongly disagree. We also disagree that Truckee can easily afford more jet traffic and jet noise or that such growth makes life better for everyone in Truckee. It is bad for the very people who fly here in private jets. 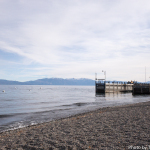 We hope that they will become aware of it and work with us on making Truckee better and more beautiful and environmentally safe for everyone, including themselves. 1. Local homeowners are paying approximately $4.5 million per year in a property tax subsidy to the Truckee – Tahoe Airport. This public money is administered by the elected five-person Board of Directors and Truckee airport staff. Most local residents are not aware that they are paying a subsidy which benefits mostly a small, affluent segment of the community. 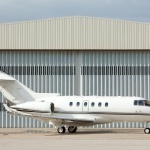 The vast majority of local homeowners cannot afford to fly private jets and other planes using the airport. Truckee is believed to have one of the most dangerous general aviation airports in the United States because of its location, altitude and weather. The airport is positioned right next to the downtown area. 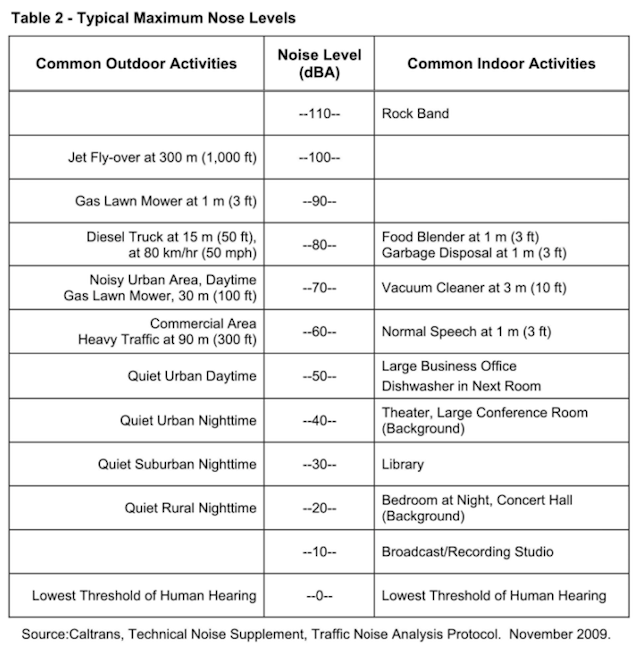 The impact of plane traffic and noise on residents is significant and increasing. Plane/jet noise complaints from residents are increasing as well. 5. While some Truckee Tahoe Airport District Board of Directors members are concerned about the impact of growing jet traffic and noise on local residents, future generations, environment and wildlife, others want to scrap or modify the 2004 Resolution on Limiting Jet Noise as being “outdated,” and resist taking meaningful steps to discourage further growth of jet and other plane noise pollution.